English is a fun language to learn (here are 9 reasons why it rocks), and even though it’s considered an accessible and relatively easy one to learn, with 750,000 words and spelling that can throw off even the most skilled learner, learning English fast can seem impossible. But I’m here to tell you that it isn’t – as long as you have the right strategy. 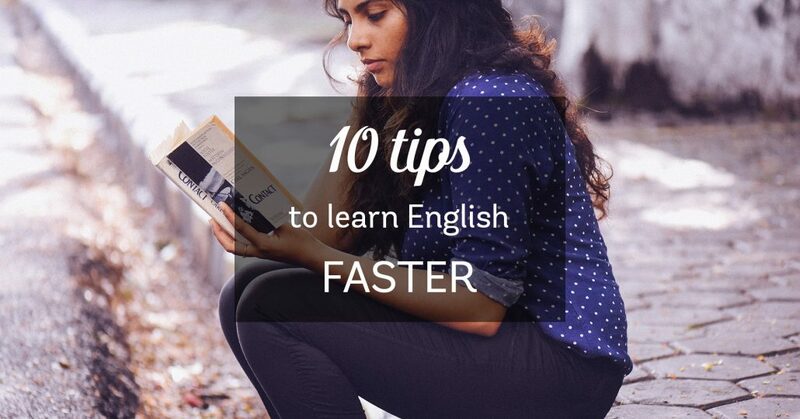 Take these 10 tips on how to learn English faster as your starting point and you’ll master this wonderful language in no time! What is a language for if not to communicate? Sure, we humans have become experts at communicating without opening our mouths – thanks Whatsapp! – but when push comes to shove, it’s true that speaking a language helps it stick in your head far better than only reading or writing it. Just think of how many times you’ve heard people say that they “understand, but can’t speak English.” A lot of would-be English speakers have turned talking into a huge insurmountable barrier that only serves to psyche them out. Don’t be like that. Seek out native speakers for an informal language exchange, enroll in a course, or take classes online. Curiosity may have killed the cat, but it also propelled the language learner to fluency! As you learn English, you’ll soon collect a mountain of questions. Don’t sit on your doubts – be curious and resolve them! If you’re enrolled in a course, ask your teacher (it’s what they’re there for, after all). But if you’re learning alone, don’t worry: find answers in blogs or language websites, ask other learners, or read through forums. You’ll be happy you did!